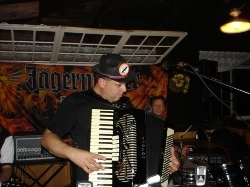 Don't worry....the guys in FPB didn't drink too much Jagermeister and end up in the "clink" after their awesome gig at the German Club Oktoberfest in Binghamton, NY on September 27th. Rather, they just took advantage of a great silly photo moment after their gig wrapped up. 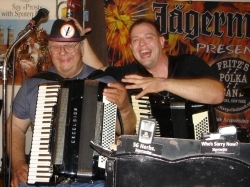 Fritz helps his Dad, Fred, put on a special Jagermeister Oktoberfest hat toward the end of FPB's festive gig at the German Club Oktoberfest in Binghamton, NY on September 27, 2008. 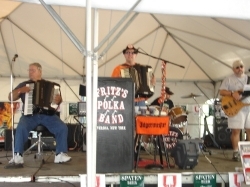 Fritz with his Sonola and George with his Rogers are shown here tearing through a tune on September 27th in Binghamton, NY at the German Club Oktoberfest. 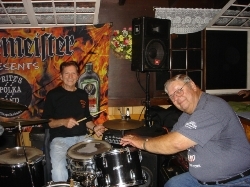 Fred gives special guest drummer, George Staley, a hand on the drums during FPB's third set on September 27, 2008 in Binghamton, NY. 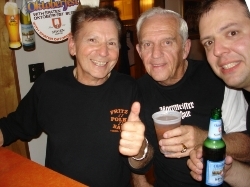 Special guest drummer, George Staley, along with Tom and Fritz are pictured here prior to FPB's third set on September 27th at the German Club in Binghamton, NY. 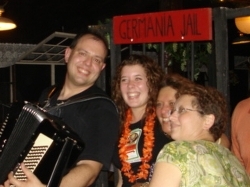 Tom is pictured here at the German Club Oktoberfest in Binghamton, NY on September 27th with Danielle and Heather (who could certainly be Jagerettes if they wanted to). 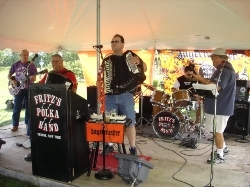 Fritz hit the dance floor during FPB's rippin' gig at the German Club Oktoberfest in Binghamton, NY on September 27, 2008. 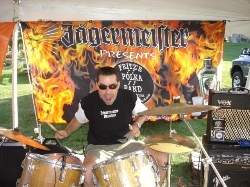 Fritz presents some Jagermeister stretchy shirts to some new FPB fans on September 27th in Binghamton, NY. 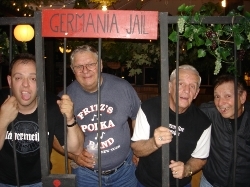 Fred, Fritz, Rick, and Gabe are pictured here during FPB's gig at the Bear Mountain Oktoberfest in Bear Mountain, NY on September 21st. 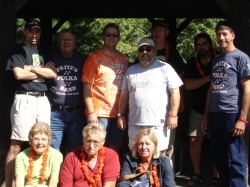 Rick, Fred, Fritz, Gabe, and Frank pose here with FPB Fan Club Members, Betty and Charlie Miller, as well as friends of the Miller Family on September 21st at the Bear Mountain Oktoberfest. Don't worry....Rick's not getting burned by those flames behind him, as he drums along toward the end of FPB's gig at the Anthony Road Wine Company on September 20th. 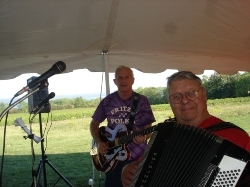 With Seneca Lake in the background, Tom and Fred are shown here during FPB's third set on September 20th at the Anthony Road Wine Company in Penn Yan, NY. 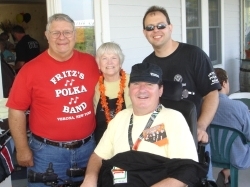 Fred and Fritz, along with Ann Martini (owner of Anthony Road Wine Co.) pose here with John, as Fred and Fritz presented him with some Jagermeister goodies during FPB's gig at the Anthony Road Wine Company on September 20, 2008. 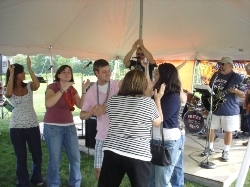 Some ladies and one lucky guy dance as Fritz and Gabe sing and clap along during "Old Time Rock And Roll," during FPB's second set on September 20th in Penn Yan, NY. Tom, Fred, Fritz, Rick, and Gabe tear through their opening tune on September 20, 2008 at the Anthony Road Wine Company in Penn Yan, NY.